As we welcome 2016 today, two issues that will continue to dominate in the New Year are China’s rise and the war on terror. But beneath the brinkmanship of China and the United States or the bloody events in the Middle East where terrorism is being further brutalised are the undercurrents of a global order in transition amid the global balance of power in disequilibrium. This has created uncertainties; and foreign policy decision-making has become a big gamble for developing countries – a situation similar to the one they faced during the Cold War era. Sri Lanka’s Government that pledged to follow a non-aligned foreign policy would do well to take note of this balance of power disequilibrium so that it can make informed foreign policy decisions. The balance of power disequilibrium indicates the world political order is transiting from the United States-led unipolar world order that came into being with the end of the Cold War in 1991 to a likely bipolar world. The manner in which the Asian and African countries shaped their relations with both China and the United States in 2015 points to a bipolar world order on the horizon, though this may not take the shape of the Cold War that divided the world following the end of World War II. Perceived Power (PP) = (C+E+M)x(S+W). C in this equation denotes the critical mass consisting of the size of the population and the territory, E economic capability, M military capability, S strategic purpose and W the will to pursue the National Interest. With China, the most populous country in the world, making remarkable headway in economic, scientific and military fields, it is unlikely that any county can match the Asian giant if we apply Cline’s equation that was devised in the late 1950s. But an improvement to this equation should be the addition of a country’s ability to form defence partnerships with reliable allies. Perhaps, on this score, China may not be as successful as the United States today, but sooner or later it can be a different story. The year that moved into history’s archives yesterday was a one big megabyte file containing moves and countermoves by the US and China to win allies. These developments were taking place against the backdrop of the United States’ sole superpower position being seriously undermined on the one hand by the rise of China, and on the other by Russia’s assertive policy as seen in Ukraine and Syria. The world order in 2015 was in such a state of flux that alliance formation was a daunting task for many developing countries. 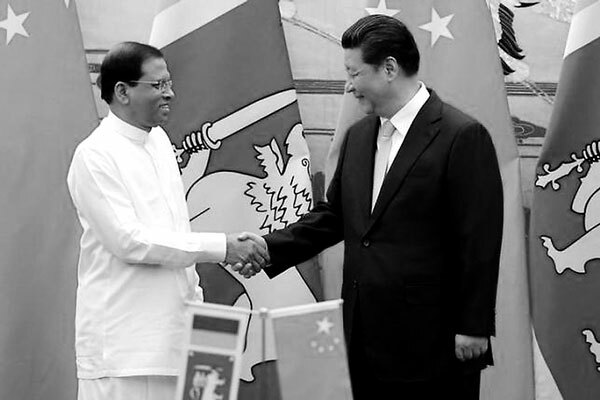 While many countries, with the aim of benefiting from the best of both worlds, avoided being dragged into big power politics, Sri Lanka in 2015 was seen to be making corrections in the foreign policy realm, with President Maithripala Sirisena meeting US President Barak Obama and Chinese President Xi Jinping. Did Sri Lanka make the necessary corrections and maintain the right balance in the light of the global balance of power disequilibrium? Yes, there was some correction but it was far from the new government’s pledge to follow a non-aligned foreign policy. We agree that non-alignment, as a policy, has been dead for a long time. But a revised non-alignment policy is the need of the hour in view of the prevailing uncertainty in the global order, which is best understood in terms of a struggle between nations for power or global dominance. Just as the rise of China is a reality, the United States’ effort to maintain its global dominance is also a reality. When equilibrium is established in time to come, Sri Lanka should not be seen as backing the loser. This is all the more reason why we should redefine non-alignment and be the friend of both the United States and China. But our foreign policy behaviour sometimes makes us wonder whether we are now placing all our bets on the US, like the Mahinda Rajapaksa regime, in casino style, placed all its chips on China. True, because of the thaw in relations with the United States after the January 8 change, the country has managed to somewhat extricate itself from the United Nations Human Rights Council trap which the US together with its western allies had set. But we should not be so naïve as to believe that the reward is for the new government’s good governance drive. Rather it is for Sri Lanka’s move to keep China at arm’s length or to lower its relations with Beijing to normal from what were hailed as very special. This was what Myanmar’s military-backed regime did in the face of United States’ threat to impose international sanctions. The visit of US Secretary of State John Kerry to Sri Lanka, the many visits of Assistant Secretary Nisha Biswal and other envoys such as Thomas Shannon indicate Sri Lanka has willingly or unwillingly strayed into the US-led camp instead of steering a newly defined non-alignment course. Sri Lanka’s apparent drift towards the US camp coincides with South Asia looming large in the nascent cold war between the US and China. The year just ended saw, all of a sudden, the mentioning of a region called Indo-Pacific, especially in US and Indian statements. Till 2015, the term Indo-Pacific was largely a biogeographic term. The term has a serious cold-war-like strategic connotation when used in a political sense. It could mean that the United States’ ‘Pivot-to-Asia’ policy, which had originally been confined to the Asia Pacific region is now incorporating the Indian Ocean region. The evidence is found in India’s close economic and strategic relations with not only the US but also the countries which China has locked horns with over territorial disputes, and in the United States’ Trans Pacific Partnership agreement, which, many analysts believe, is a tool to counter China’s One-Belt-One-Road global economic drive. However, in an economic sense, the Indo-Pacific region concept needs to be promoted, if China and all the other countries in the region could strike a mega union of sorts. Sooner or later, Sri Lanka could be drawn into an Indo-Pacific arrangement. If it is for trade, we must say yes. If it has strategic undercurrents, then we must be cautious. We may even follow Britain’s example or Pakistan’s stance. Though being a close ally of the US and a leading NATO member, Britain in recent years has ignored protests from human rights groups and strengthened its relations with China to gain maximum benefits from China’s economic growth. Pakistan, a key ally of the US in the so-called war on terror, is set to experience an unprecedented economic take off with Beijing pumping in more than US$ 46 billion in the next three years to build an economic corridor that will connect the Middle East with China.